Dollkraut’s music often sounds like a past that was more beautiful, more broken and more glimmering than it actually was. Pascal Pinkert dares to sound like no one else, cinematic and glamorous, rough and haunting. His tracks are driven by a deep love for old lo-fi fuelled recordings, 70’s space age synthesizers and John Barry meets Ennio Morricone fuzziness galore. 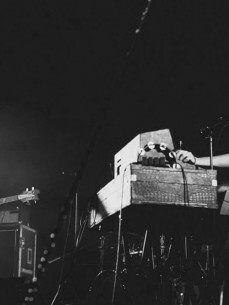 In 2012 he started his own post-rock/experimental band LOLA and performed at venues like the Übel und Gefährlich in Hamburg, Gloria in Cologne and at Berghain. In 2013 he produced the ‘Theme Of Fukoyama EP’ for the Amsterdam based label Tape Records. Artists like Dixon, Midland and Steffen Bennemann charted the title song, but for those who are not familiar with Dollkraut, it should be pointed out that most of his work can’t be labeled. Dollkraut’s ‘Blackbox EP’ (2014) for Rotterdam based label Charlois topped many charts as well: fat, arpeggiated body rockers resulting in disco bombs with driving bass and glorious synthwork, all with that super round and wide Dollkraut-esque production style. In that same year Pinkert delivered his most notorious work to date. The ‘Schimanski’s Black Lullabies LP’, released on Brandt Brauer Frick’s imprint The Gym, is a wide-spread and epic travel using vintage vocoders and filters, while Dollkraut himself takes care of the vocals, ensuing haunting themes on several of the albums songs. The album flits between styles at will – bold African rhythms, post-punk, soundtrack based, Serge Gainsbourg style sleaze and odd guitar-laden lo-fi rock sketches – whilst retaining a unique dustiness and aural sensibility. In 2015 Dollkraut returned to Charlois with his Hornet Green EP. This time he delivered tracks with grubby percussion, vocoder tones and faint yet compelling homages to the traditional music of Mexico and Spain.